Root growth is critical to the establishment of planted seedlings. Seedlings can undergo stress just after planting if root growth is not sufficient to couple the seedling to available soil water. Stress occurs when a newly planted seedling’s root system can not supply enough water to transpiring needles to maintain a proper water balance and ensure survival. Thus, a newly planted seedling’s ability to overcome planting stress is affected by its root system size and distribution, root–soil contact, and root hydraulic conductivity. 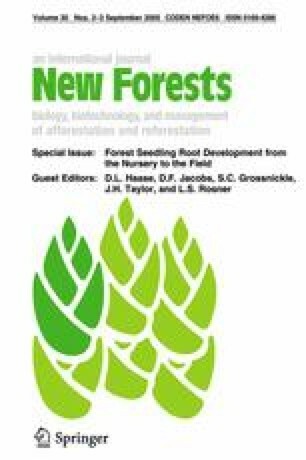 This paper describes how factors of root growth and water status of newly planted seedlings are important in overcoming the phenomenon of planting stress which then allows a newly planted seedling to enter the establishment phase of development.